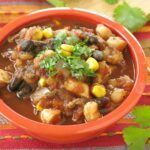 This Fast and Easy Chicken Tortilla Soup Recipe with hominy takes less than 30 minutes to make! Mexican inspired dinners always bring out a smile. That’s why you’ll find us making dishes like Burrito Pie Casserole and Mexican Street Corn in a Cup on a weekly basis. It’s a meal planning thing. That’s just what we do on Taco or Tex-Mex Tuesdays! 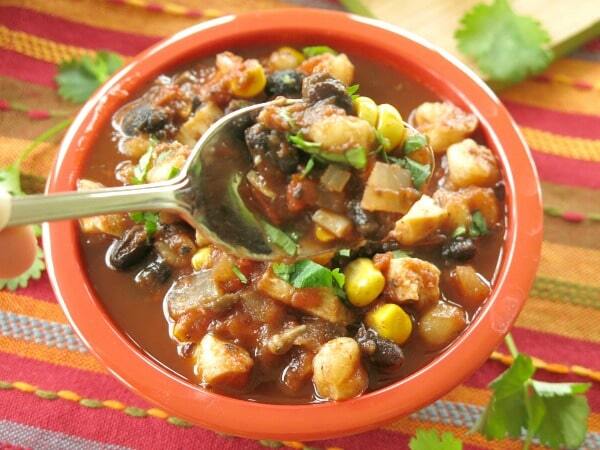 This recipe is a variation of Shrimp Tortilla Soup. It’s really the same recipe, except that you’ll need cooked chicken. And, we’ve got you covered with a chicken recipe that’s perfect for recipes just like this. This is easily The Best Mexican Chicken Tortilla Soup recipe. It’s healthy, fast and the perfect combination of fresh and convenience ingredients. To begin, saute onion and garlic in olive oil in a large stock pot. Add the remaining ingredients to the pot and bring the soup to a boil. Reduce heat and simmer for about 10 minutes. The key is to have all of the ingredients prepped before you begin. Chicken – Use leftover chicken, if available. Otherwise, make 3 Ingredient Salsa Chicken or Baked Lemon Pepper Chicken. Cubed or shredded chicken that is frozen does not need to be defrosted first. Corn – Fresh corn really makes this Mexican Chicken Tortilla Soup pop. It takes about 2 minutes to Microwave Corn on the Cob. You’ll only need 1 large ear of corn. Frozen corn does not need to be defrosted first. 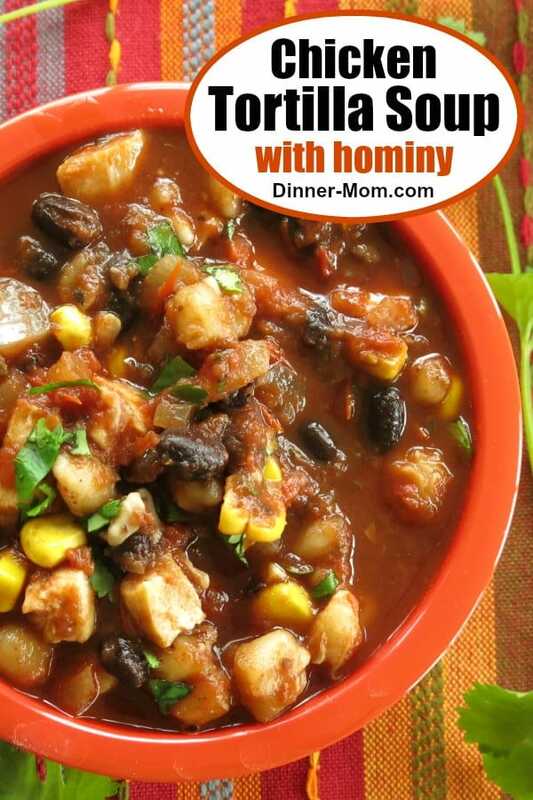 Hominy – Have you ever tried it? It’s a type of corn that has been processed to remove the hull and germ. Read more about What Kind of Corn is Hominy at The Spruce. This ingredient can be left out if desired. Cilantro – If you don’t love it, leave it off! Of course, black beans can be cooked from dried and fresh tomatoes can be crushed. However, if using canned products, open them up and have them ready to go! Leave out the chicken and add tofu or extra beans for Vegan Tortilla Soup. This is the exact recipe we used at our Make Ahead Meal Kitchen. Add all of the ingredients to a freezer bag. The chicken should be cooked. Nothing else needs to be cooked first! Remove excess air from the plastic bag and store it flat, so it will defrost quickly. When you’re ready to make the soup, defrost the bag overnight in the refrigerator. Pour the contents into a large pot and cook starting with Step 3. Easy Chicken Tortilla Soup is ready in under 30 minutes. It's the perfect combination of fast and fresh ingredients. Add remaining ingredients (except for cilantro and optional toppings) to pot and stir to combine. Note: Frozen corn and/or frozen cubed chicken do not need to be defrosted first. Bring soup to a slow boil. To make ahead and freeze, add all the ingredients to a freezer safe bag and store in the freezer for 2-4 month. Defrost completely and following cooking instructions begin with Step 3. Tortilla soup is my favorite! And I like this even better if it is freezable! Thanks! It’s a nice dish to have in the freezer! I love soup and this looks exactly what my family would love. I can’t wait to try it.